As a Certified Chiropractic Sports Practitioner (CCSP), Dr. Callotta has advanced training in athletic injuries and treatment. 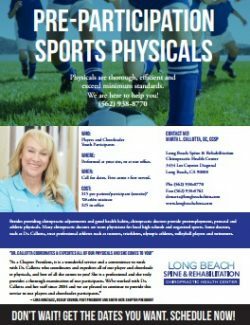 She is available to provide low cost, comprehensive and efficient sports physicals for multiple athletic teams throughout the Los Angeles and Orange County areas (PPE*). By coming to the team, she makes it convenient for coaches and cost effective for parents. Call us today for more details on sports physicals! Contact us to schedule your next physical or call 562.938.8770.